Because we live in a fast changing world in which technology plays an important role in the classroom. This is a great opportunity to Live Curiously in the Art room and Go Beyond the traditional tools that already exist and take advantage of the students' knowledge of this technology and together expand the horizons of the art that we can produce. 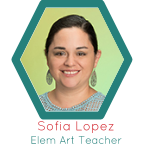 During this las couple of week I have been looking for a place in which I can collect student work, products to keep as examples of units that I teach, special activities and events happening in the art room. One of the tools I was actually looking at before this meeting was E-Portfolios on Haiku. I am going to start adding content it. Looking for other E-Portfolio platforms is also something that I want to do not just for student work but also for personal work and finding ways to share those portfolio with parents and others. This has been a great challenge for me. I am trying to have more opportunities for students to use tech in the classroom by combining or complementing lessons with the use of a various applications on the ipad. Some students have a chance to create images and edit them with art applications, some student have a chance to add on to their art pieces and make them come to life, and finally we also use tech to share our art work with family and friends. This creates in students a feeling of pride for their own work and it shows parents what their child is doing in art class. For sure one of the most interesting TED talk videos I have watched in the las couple of months. What stood out for me was that if we want to understand our students' learning, WE have to become learners ourselves. Being a teacher is a VERY important job and it is one that is evolving to fit student needs every single day. If you do not have a "learner" mindset you will eventually become obsolete.